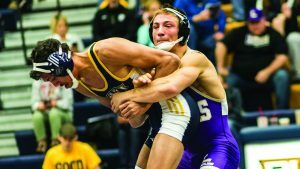 On Saturday, Nov. 10, the Loras wrestling team took part in two different tournaments at Platteville, Wisconsin: the Super 8 Invitational and the Luther Open. In the Super 8 Invitational, four Duhawks were crowned champion. The first champion was sophomore Jake Hiles, who competed in the 125 weight category. Receiving a bye in his first round, Hiles moved onto the quarterfinal, where he defeated University of Dubuque’s Richard Diaz by fall with a time of 1:20. In the semifinals, it was Duhawk versus Duhawk with Hiles taking on sophomore Mateo Sanchez. Hiles overcame Sanchez, winning by fall at 0:53. Showing their dominance over the other teams in this category, it was another Duhawk versus Duhawk match in the final round. Hiles competed against junior Matt Randone. Gaining his third win by fall, Hiles triumphed over Randone at 2:01 of the match. In the 141 weight category, senior Kevin Kelly was crowned champion. In the first round, Kelly fought and won against Nile Laguna of University of Dubuque by fall at 1:47 of the match. In the quarterfinal, Kelly competed against Sean DeBuck, another University of Dubuque student. It was a tougher match this time, but Kelly overcame the odds, gaining his second win through a technical fall with the score 16-1. Moving on to the semifinal, Kelly faced off against his third University of Dubuque opponent, Nick Meyer. Winning by decision with the score 10-5, Kelly moved onto the finals, where he competed against UW-Platteville’s Chase Katzenmeyer. Kelly defeated Meyer, winning by decision 8-1, giving him the champion title. Junior wrestler Brandon Murray maneuvers his way around his Buena Vista opponent in the first meet of the year, Murray dominated the match from start to finish. Senior Javier Soto was the third champion to be named. Moving on past the first round of the 184 weight category through a bye, Soto competed against his first of three University of Dubuque opponents, Jay Gonzales. Overcoming Gonzales through a technical fall with the score 15-0, Soto went on to wrestle Jack Allen in the semifinals. It was a close match, but Soto managed to defeat Allen through a decision with the score 6-1. In the finals round, Soto competed Kevin Royce, who he defeated by major decision with an ending score of 10-1. The final Duhawk champion to be crowned in the invitational was junior Guy Patron Jr. in the 197 weight category. Winning his first match by decision 10-9, Patron Jr. went on face off against Joseph Scheidt of the University of Chicago. Overcoming him by gaining a fall at 1:14, Patron Jr. next had to wrestle UW-Platteville’s Tyler Pasker. During this match, Patron Jr. gained his second winning by fall at 2:08 of the match. In the finals, Ethan Cain of University of Dubuque was Patron Jr.’s opponent. This was a tougher match for Patron Jr., but he still won through a decision with a final score of 10-9. In the Silver bracket, first-year Zeke Smith competed in the 125 weight category. In his first match, Smith wrestled Justin Montani of W Whitewater. Smith defeated his opponent through a technical fall with the score of 17-1, allowing him to move onto the quarterfinals, where he faced off against Caleb Clobes of Rochester Community and Tech. College. Through a major decision of 11-1, Smith moved into the semifinals. Although it was close Smith overcame Coe’s Diego Ortega through a decision of 4-2. Kobey Pritchard of Wartburg was Smith’s final opponent. Through another decision win of 13-8, Smith won the final round and was named a champion of the Silver bracket. 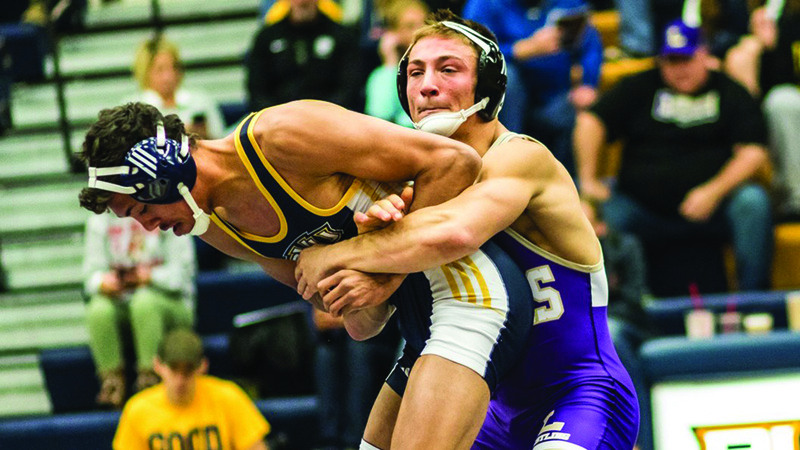 Next on the Loras wrestler’s schedule is the CUW Open on Saturday, Nov. 17.